Pasta is a type of noodle made from an unleavened dough of a durum wheat flour mixed with water or eggs. Pastas are conventionally divided into two categories, dried and fresh. Both fresh and dried pasta come in a number of varieties and shapes. There are more then 300 specific forms of pasta such as spaghetti, penne, pennette, canneloni, farfalle, gnocchi, alphabet pasta, and many others. Many pasta varieties have more than one name; over 1,300 names have been documented. The first reference to pasta dates to 1154 in Sicily. Pasta manufacturing machines were first made in the early 17th century. The word “pasta” was first attested in the English language in 1874. Pasta became popular in the United States thanks to Italian immigrants. Pasta is a very versatile food item. It is typically boiled and served with different sauces. It can also be used as an ingredient in salads. 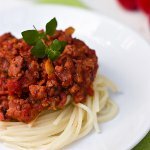 There is a great variety of pasta dishes such as spaghetti bolognese, spaghetti carbonara, fettuccine Alfredo, baked ziti, lasagne, mac and cheese, ravioli, spaghetti with meatballs, American chop suey, and many others. To celebrate the National Pasta Day, go out to an Italian restaurant or cook your favorite pasta dish yourself.